If you are a busy person and you spent almost half a day talking on your iPhone, or If you travel a lot, and do not always have a place to recharge your iPhone, there s a solution for you. Mophie created a very useful external battery pack for your iPhone called “Juice Pack“. By the help of a “Juice Pack“your iPhone will get additional 250 hours of standby, 24 hours of audio playback, 8 hours of talk time, 7 hours of video and 6 hours of internet browsing. Shortly it doubles your iPhones battery life. 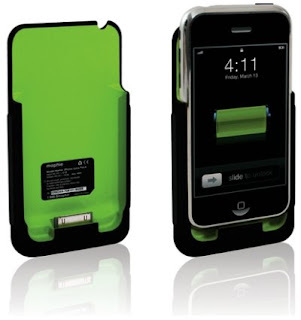 The Juice Pack is a rechargeable lithium polymer battery in the form of a non-slip, soft grip case. The new product, offered by Mophie costs $99.95, and can be purchased from Mophie store.